1. Place diced pancetta, olive oil, melted butter and herbs into a large mixing bowl and mix well. Add McCain Roasts and toss to coat. 2. Tear 4 x 30cm portions of foil and lay them on a flat surface, divide McCain Roasts mixture evenly atop the foil, along with any remaining mixture left in the bowl, then carefully fold the edges of the foil to the middle to create a seal. 3. Heat a BBQ flat plate to a low-medium heat, place parcels on the grill and lower cover. Turn parcels after 7 minutes and cook for another 5-7 minutes or until potatoes are tender and pancetta is crispy. 4. Remove parcels from grill, open the foil carefully and beware of escaping steam, top with freshly grated parmesan and serve immediately. 1 Place diced pancetta, olive oil, melted butter and herbs into a large mixing bowl and mix well. Add McCain Roasts and toss to coat. 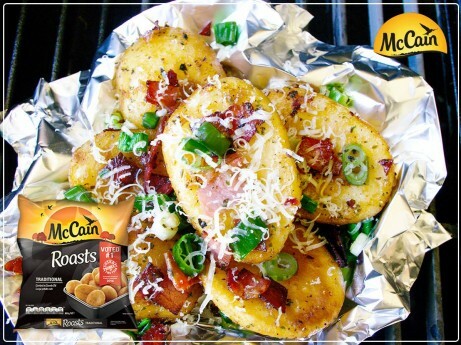 2 Tear 4 x 30cm portions of foil and lay them on a flat surface, divide McCain Roasts mixture evenly atop the foil, along with any remaining mixture left in the bowl, then carefully fold the edges of the foil to the middle to create a seal. 3 Heat a BBQ flat plate to a low-medium heat, place parcels on the grill and lower cover. Turn parcels after 7 minutes and cook for another 5-7 minutes or until potatoes are tender and pancetta is crispy. 4 Remove parcels from grill, open the foil carefully and beware of escaping steam, top with freshly grated parmesan and serve immediately.